In this lesson, I will show you how you can use keyboard shortcuts to manipulate filters in Excel. To create a filter with a keyboard shortcut, click a cell inside data and use Ctrl + T or Ctrl + L shortcut. It will transform your data into a table. Excel will ask you whether your data has headers or not. In this example, we have headers (Name, Surname) so we have to check this option. New icons called filter icons appeared in the headers. There is another way to create filter icons using keyboard shortcuts: Ctrl + Shift + L.
With these keys, you can, just like in the previous method, create filter icons. This time, you need to have headers in the columns. Our example has headers, so we can use this method. Click any cell inside the data and use the shortcut. It will add filter icons, the same way as when we were creating a table, but this time we won’t be asked whether our columns have headers, and it doesn’t format our cells visually. In order to turn off filter icons use Ctrl + Shift + L again. When you use the Ctrl + Shift + L keyboard shortcut to turn off filtering, all your filtering options will be lost. You can access filter drop down menu with a keyboard shortcut. But first, you need to move your cursor to the column header. Now, you can use Left Alt + ↓ shortcut. You can navigate through the menu options using the Tab key or Arrows. If you want to select or unselect table elements, move to this element and use Spacebar. You don’t have to navigate through elements using arrows or tab, but you can also use keyboard shortcuts. After you use the Left Alt + ↓ shortcut you can use one of the following. In the previous example, I showed you how you can clear filter in one column. 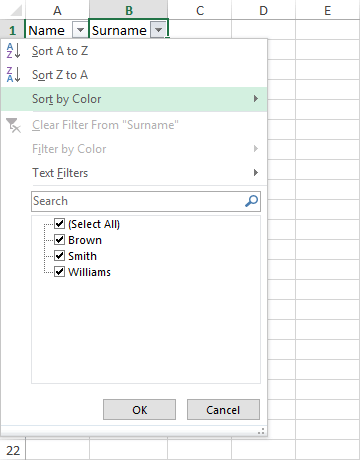 In this part, you will learn how you can clear filters in all columns using your keyboard. This is not the standard keyboard shortcut because this time we will press one key after another. Press Alt >> A >> C to clear all filters.